How Much Does it Cost to Develop a Music Streaming App like Tik Tok? Today, music and video making apps are apparently slaying youth and has become a must have app for 20’s kids. This is the reason behind the demand of Tik Tok clone app development in the online market. Gone are the days when most of the youth binged on the TV shows and Spotify to groove to an endless mix of music. Now they have taken themselves to the light via popular social networking apps like Tik Tok (previously Musical. Ly). 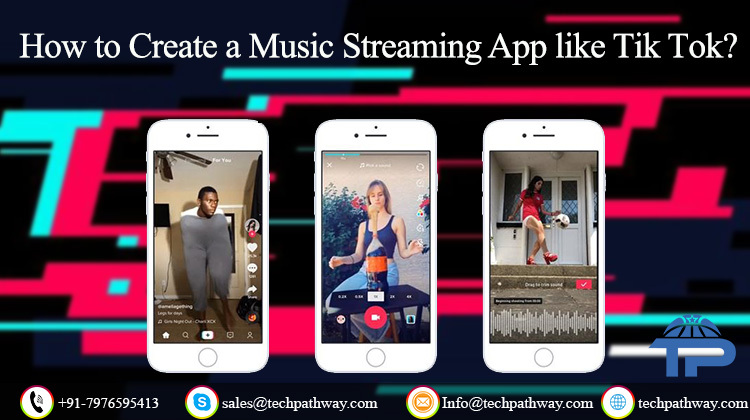 Tik Tok is music streaming app where users can make a 15 second video single/duet by lip synching and dancing along to the music embedded in the app or uploaded by themselves. Users can follow and get followed by others on the app. The app enables users to watch the million of videos that are shared by the others on the app. They can select videos among the available categories such as funny videos, serious videos, informative as well as interesting ones. Therefore, this app serves as a platform for millions of users to display their knowledge, talent and valuable moments. The app also allows users to edit the videos with animation, sounds, filters and more. The app offers 100+ face filters and emoji stickers. The tools within the app allows users to trim, cut and merge the video clips. Likes are Given in the Form of Hearts. Real-time Analytics: an important feature for admin as this enables him to analyze live viewers and broadcasters in a graphical manner. Video Streaming Architecture: it is a main aim of this kind of app. Streaming from outside server will always keep your app lightweight. Besides, always keep an option to save the videos in external storage of the user’s device. Geolocation: this is a great addition to any video streaming app as with the help of this user can find broadcasts as per their region. Push Notifications: this feature is useful for the users to keep them notified about the current happenings without being on the app all time. What is the Development Cost? This music video platform is the fastest growing app in the world. The factors which affect the cost of this kind of app are a number of platforms, region, design complexity, resources required, number of hours, etc. Keeping all the factors in mind the cost of developing an application like Tik Tok would cost you around $2000 to $4000. It can vary on the bases of customer requirement or functionality of the application.